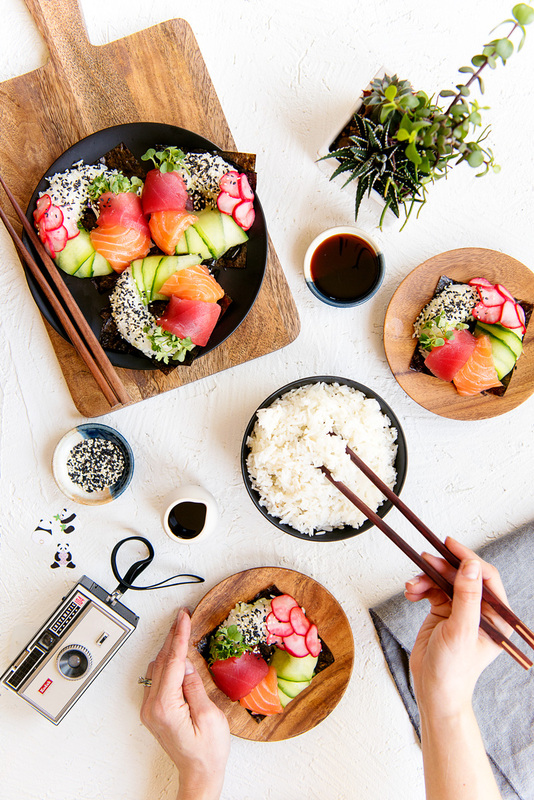 Let’s learn how to make sushi donuts. Not only are they totally on trend, they are fun to make and actually taste AMAZING! Recipe includes step-by-step photo tutorial. 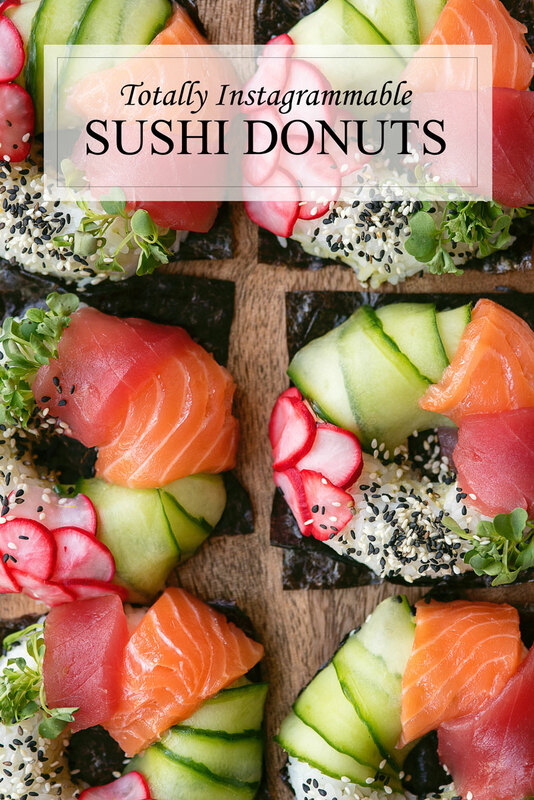 Sushi donuts are a trend I can get behind. Unlike many of the outrageous foods you see on Instagram, this recipe actually lives up to the hype. They look great – totally show stopping to be more precise – but they actually taste amazing. I already had a donut baking pan on hand and it worked fine for these donuts. To prevent sticking I lined them with plastic wrap. Silicone donut molds will also work great for this recipe and you don’t need to line them. 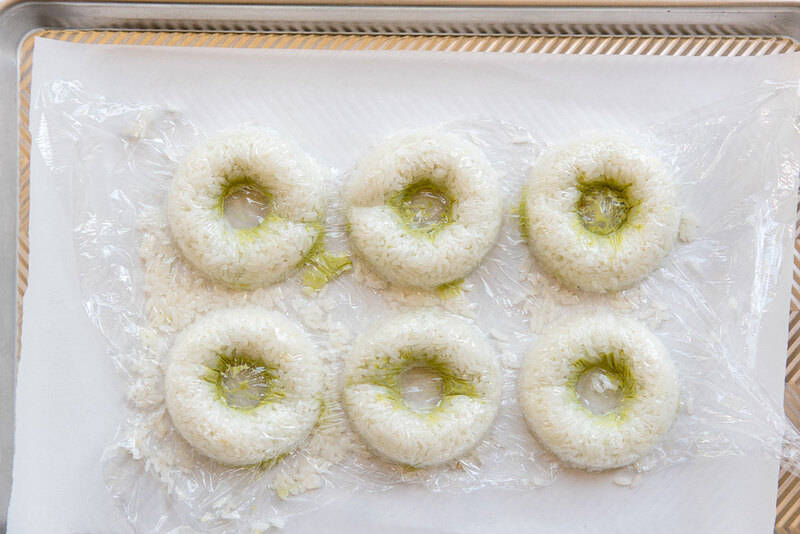 The trick is to press the rice firmly into the mold so it keeps that nice donut shape even when you remove them from the mold. The sky is the limit for donut toppings! 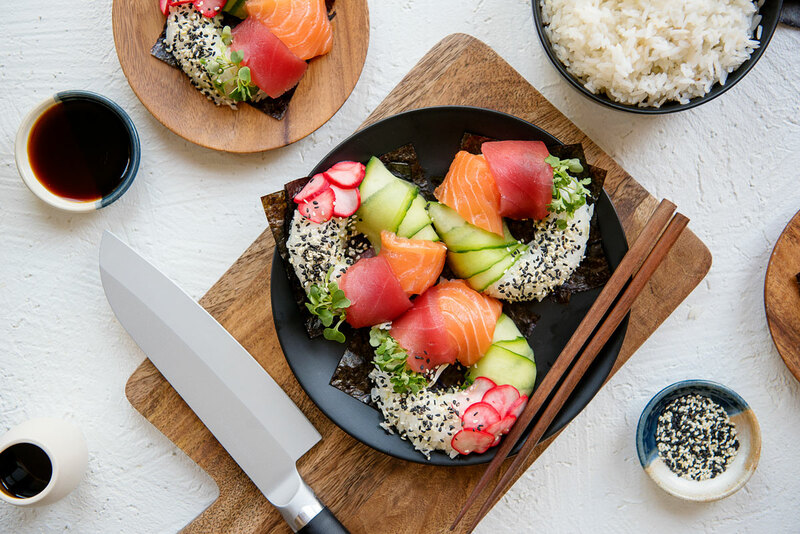 If you are using fish, it’s imperative that you buy sashimi grade fish. It’s more expensive but it’s the only safe way to eat raw fish. 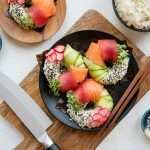 If you can’t find sashimi grade fish where you live, you can also use smoked salmon. Other toppings to consider are cucumbers thinly sliced into ribbons with a vegetable peeler, radishes, roe (fish eggs), tamago (Japanese cooked egg), pickled ginger, sesame seeds, sushi seasoning (furikake), avocado, pickled radish (recipe included here), red cabbage, sprouts, edible flowers, spicy mayo, shrimp, and scallions (green onion). If you’re looking for a place in the San Francisco Bay Area to buy sushi donuts you’re out of luck for now. I haven’t been able to find a restaurant that serves them. The closest location I’ve found is Project Poke Co. outside of Los Angeles in Fountain Valley, CA. If you do find a place in San Francisco, let me know! Until then, my version is pretty darn delicious. My favorite place to buy sashimi grade fish in San Francisco is Nijiya Market in Japantown. Their fish is always very fresh and reasonably priced. I know some Whole Foods carry sashimi, but the ones I have checked in San Francisco and the East Bay do not. An option for sashimi in the East Bay is Tokyo Fish Market. Wash uncooked sushi rice until water runs clear. Let sit for 15 minutes. Combine rice and 2 1/2 cups of water in a small saucepan and bring to a boil. Cover and reduce heat. Cook about 30-35 minutes over medium low heat. Stir together the rice vinegar, sugar and salt in a heatproof bowl. Microwave at 30 second intervals until sugar is full dissolved. Stir mixture into sushi rice. Set aside to cool. 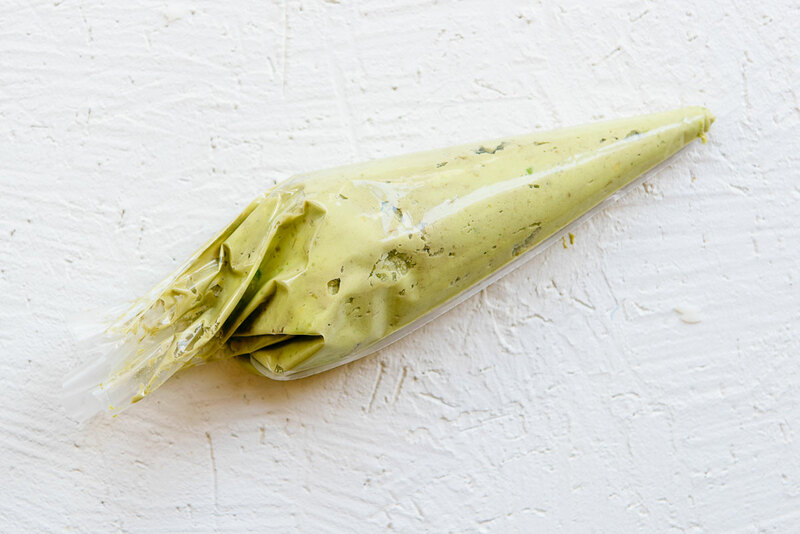 In a medium bowl, use a hand mixer to blend together the avocado, cream cheese, lemon juice, wasabi and salt until smooth. Transfer to piping bag or gallon freezer bag. If using the donut pan, line the pan with plastic wrap. Press the prepared rice into donut mold or pan, leaving a well. Snip the tip of the piping bag filled with avocado and pipe it into the well. Top with more sushi rice. 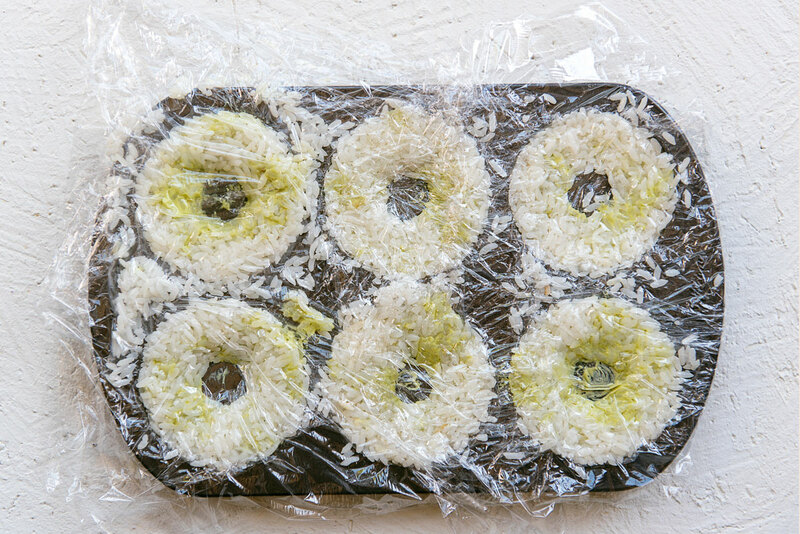 Cover donuts with plastic wrap and press the rice together until tightly packed. Let sit for 2-3 minutes. 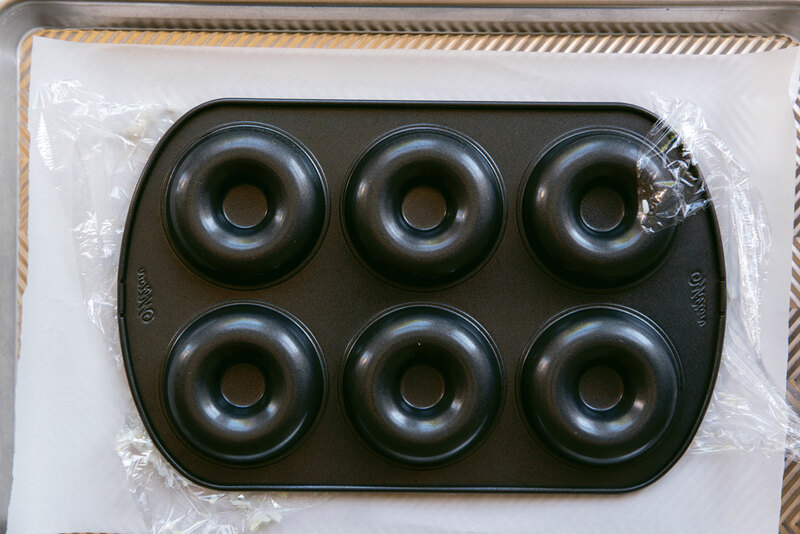 Place a baking sheet lined with parchment paper on top of donut mold and flip over. Gently unmold donuts. Remove plastic wrap. Slice radishes thinly using a mandolin slicer and place in a small bowl. Cover with rice vinegar and a pinch of salt and let soften for 10 minutes. Thinly slice fish and layer on top of rice donuts. 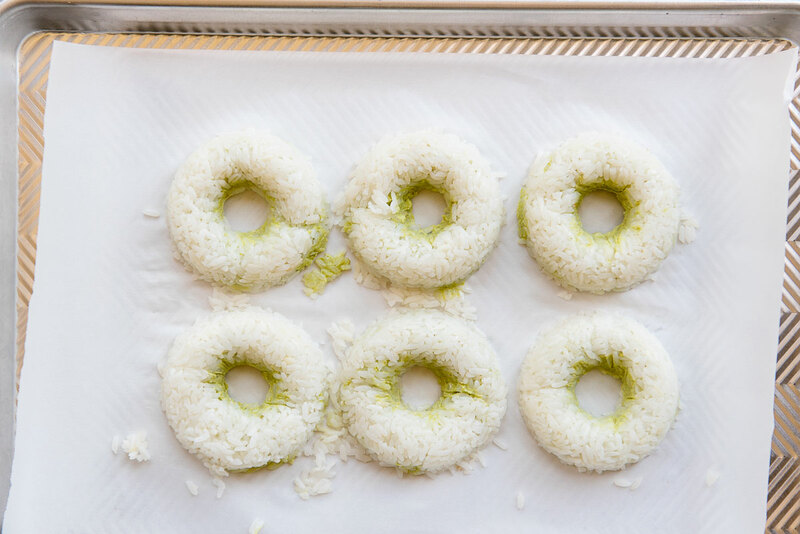 Thinly slice cucumber using a vegetable peeler and layer on top of rice donuts. Tuck ends of sprouts until one layer. Sprinkle on sesame seeds and other toppings, if using. 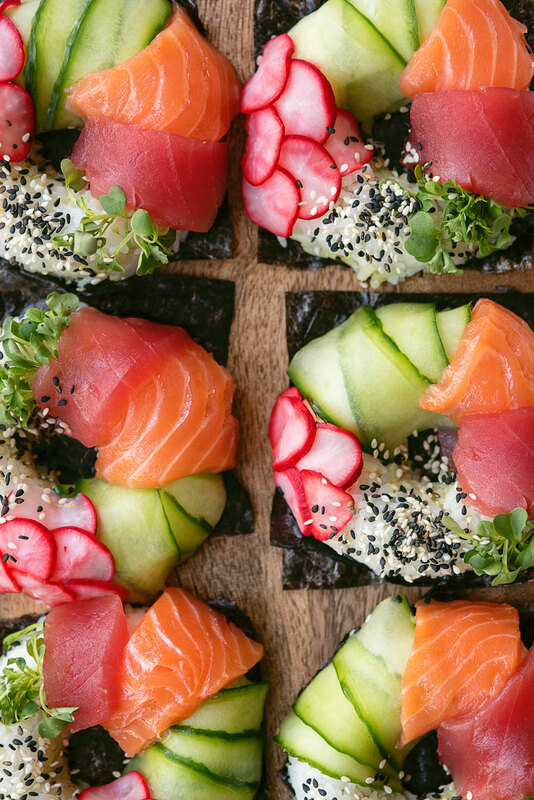 Serve on nori with soy sauce, wasabi and pickled ginger. 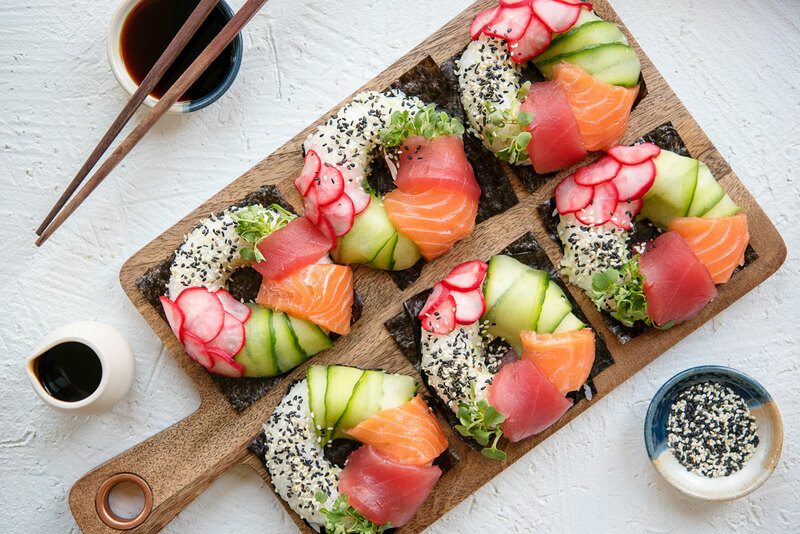 Need some sushi donuts in your life? Pin this recipe for later!